Blondie and Brownie: Nutter Butter Blizzard, Where Have You Been All My Life?! Nutter Butter Blizzard, Where Have You Been All My Life?! As much as NYC has going for it, the Big Apple is sadly bereft of a Dairy Queen. If you want a Dilly Bar or a Peanut Buster Parfait you're going to have to head to Jersey. Now hypothetically say you're a DQ Blizzard fan club member and say you get an email telling you that this month's DQ Blizzard of the month is the brand new Nutterbutter Blizzard, clearly a road trip would be in order, no? Nutter Butter® cookie pieces + Nutter Butter® peanut butter crème filling + vanilla soft serve = full on win. Why have we had to wait this long? 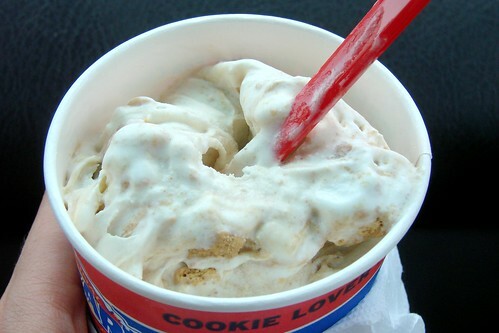 And how awesome would the Nutter Butter addition to the Cookie Jar Blizzard be? Just think, cookie dough pieces, Oreo bits and Nutter Butter chunks whirled around vanilla ice cream with a chocolate swirl. It would be a triumvirate of delicious. So many great possibilities. I can only hope that this Blizzard sticks around in the permanent rotation because if loving Nutterbutter Blizzards is wrong I don't want to be right. Omg want. Now. Um, road trip to Paramus? I know the way! I would absolutely road trip for that. hands down. Is can't be better than the Reeses can it?